Popularity of bodyweight training (aka calisthenics) has exploded in recent years. Much of that is down to folks like popular trainer Al Kavadlo, YouTube phenom group BarStarzz, and hit books like Convict Conditioning. However, the biggest influence is unquestionably CrossFit, which has taken many gymnastics training methods mainstream. I assume if you’re reading this post you know what muscle ups are, but if not here they are in all their glory. A few months ago I decided to make training for the muscle up a priority. I’ve been reading calisthenics books and watching endless YouTube tutorials on pull ups, muscle ups, dips, kipping, bar grips, and more. This post is a half time report on my efforts to date, what worked, what didn’t work, and how I plan to proceed on my mission to the muscle up. As one final bit of housekeeping before we dive in, this post is about doing muscle ups on a straight bar. I have no plans to train for a muscle up on the rings at this time. Whether you are for or against kipping, I guarantee you are not thinking about it the right way. CrossFitters have embraced kipping pull ups and kipping muscle ups whole heartedly as a way to bang out as many reps as possible as quickly as possible. Outside of CrossFit, most people still think of kipping as cheating. Both views are wrong, wrong, wrong. The kip is best viewed as a plyometric move that is an addition to maximal strength training and not a replacement for it. By way of comparison, you wouldn’t call box jumps and other mainstays of plyometric training “cheater squats.” Nor would you replace squat training with box jumps. Likewise, kipping is simply a different tool in the training toolkit. Many folks have no doubt listened to the Coach Christopher Sommer of GymnasticBodies interview on Tim Ferriss’s podcast. He says that kipping is dangerous for beginners with mobility issues and claims his gymnastic training produces athletes with superior strength to CrossFit. He is probably right on both counts. But, in my opinion, if you have good mobility and a strength base kipping is an irreplaceable training movement. It’s also not like gymnasts don’t kip. Kipping is a fundamental gymnastics move. Just watch any gymnast on the high bar and you will see kip after kip after kip. Although if you watch gymnastics you are probably more used to seeing something that looks like the glide kip than a kipping muscle up. From a real world application standpoint, pull ups and muscle ups are often talked about as a way you might escape from a predator into a tree in nature. Not if you’re doing a slow, strict muscle up to a 5 count with a lion hot on your heels you are not. You will be lunch. If you really had to escape in a hurry, you need to kip up that tree as fast as humanly possible. 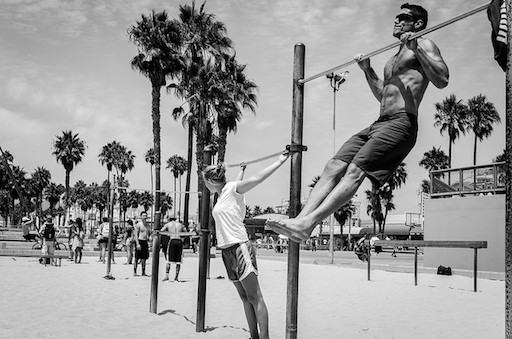 My view is that you should train for both strict and kipping muscle ups. The respective training methods both reinforce each other as well as provide mutually exclusive benefits. In addition to simply failing the movement, gripping the bar wrong can lead to frequent hand rips, popped blisters, and tendonitis in your elbows and shoulders. Correct hand placement and bar grip enable you to get maximal leverage on the bar and enable you to perform the exercise safely and effectively. Thumbs over the bar (aka the “suicide grip”) – Avoid this grip. Even though this is arguably the strongest grip and many people–especially those with small hands like me–prefer it to thumbs around the bar, it is called the suicide grip for a reason. It’s very easy to send yourself flying off the bar when you are learning how to kip. Thumbs around the bar – The preferred grip for most training. Wrapping your thumb around the bar is safer and makes it less likely you’ll go flying off the bar when kipping. To maximize skill transfer, I recommend training with this grip for both strict and kipping movements. To get the best grip, wrap your thumbs around on top of your index and middle finger to form a hook grip. Also focus on keeping your pinkie knuckle on top of the bar to keep your hands from rotating inward. Watch Carl Paoli demonstrate (skip to 2:00). False grip – This grip builds forearm strength and arm positioning crucial for the muscle up transition. Make fists and hook them over the bar so that you hang from your wrists. I guarantee the first time you try this you will immediately drop like a rock, but keep at it and just practice hanging at first. You will make surprisingly quick progress. The key is really trying to keep your bodyweight directly under the bar and your head through your arms at the bottom. This puts your weight directly into your hands perpendicularly instead of at a sheering angle that makes it easier to slip off. Don’t lean back. Watch a demonstration. Pseudo-false grip – Similar to the false grip, but with thumbs around the bar. I find this much harder because it forces the bar further out toward the middle of your hands and puts more grip-breaking leverage on your wrists. Nearly all CrossFit trainers recommend training this grip for pull ups and muscle ups. Not a single one of them actually does it in their videos. However, it can be done and if you want to do a strict, no momentum muscle up on the bar it is the only grip in town. Watch a pseudo-false grip muscle up. As far as hand placement, generally a little bit outside the shoulder line is optimal. Play around with it and see what feels strongest to you. At the top of the pull up you want your forearms to be perpendicular to the ground when viewed from your front or back side. For false grip and pseudo-false grip you will generally place hands a bit narrower to achieve the same perpendicular forearm position. One focal point I’d like to reiterate is to focus on keeping your pinkie knuckles over the bar. This prevents your shoulders from getting compromised by internal rotation. Inward rotation of the shoulder also causes inward rotation of the hands, which puts sheer force on the skin causing rips and tears. Especially when you are kipping. The way not to train muscle ups is to go flail around on a bar until you somehow miraculously make it over the top. You want to break the muscle up down into its constituent skills and build those up with targeted exercises. The bulk of muscle up training is a steady diet of pull ups and dips. Though you will want to transition from doing regular dips to Russian dips as quickly as possible. Of course, pull ups and dips alone will not get you to the muscle up. A muscle up is conventionally taught as having three parts to work on: pull, transition, and dip. However, I would actually encourage you not to think about it that way as I don’t think it is particularly helpful. Pseudo-false grip pull ups – Exactly what it sounds like, do a pull up with a pseudo-false grip. It will help to get the false grip pull up first before you try the pseudo-false grip pull up. High pull ups – Pull explosively. Try to get your self as high above the bar as possible. A good beginning target is to get the bar below your chest. Then work higher and higher until you’re getting your waist and thighs up to the bar. There should be no kipping or leg drive to this movement. Use raw upper body pulling power only. Watch Marcus Bondi show you how it’s done. Kipping pull ups – Aim for chest to bar. Don’t assume these are going to be easy. The cadence of kipping pull ups is likely much, much faster than you are used to doing pull ups and they require lots of coordination. I still struggle to do these correctly and string them together. Russian dips – Performed on parallel bars. Lower chest to bar height then rotate your forearms back and down until your elbows are outside the bars and the inside of your biceps are touching the bars. Do not rest elbows and forearms on the bars as seen on YouTube videos. Think of squeezing the bar into your chest on the way down and then pulling backward hard on the bar to get your elbows back up over your wrists on the way up. See demonstration (try to use more control at the bottom than the video, also not necessary to do these in an L-sit). Many bar muscle up progressions tell you to practice doing straight bar dips as low as you can go and then working lower and lower into the transition. I don’t recommend this in the beginning as most likely you will just drop like a rock as soon as your elbows move behind your wrists. Russian dips on parallel bars allow your chest to dip between your hands and also allow you to fall back on the bars without completely dropping out of the movement while you are still learning. Get good at them first before trying to practice transition dips on a straight bar. At this point, I’m actually thinking about trying to get the strict muscle up on the parallel bars first before I do it on a straight bar. But, in either case, I still have a lot of work to do first. I’m currently training 5-6 days a week doing short daily workouts of 2-3 sets of 2-3 reps. I think this will be appropriate for the duration. High rep workouts are great for endurance, but generally ineffective for building peak strength. Since getting your first muscle up requires primarily an increase in peak strength first, keep sets and reps low and aim instead to increase the difficulty of the movement you’re working on. Also don’t worry so much about specific sets and reps. Think of your workouts more as technique practice sessions. For example, when learning Russian dips just focus on getting in and out of the bottom position with control and minimizing use of momentum. Just do individual reps allowing for plenty of recovery time to really get it right and feel your way through the movement. In the beginning your goal should be to constantly work on developing better control and range of motion. One single rep with perfect technique should be easy before you start worrying about sets and reps. However, don’t push your limits every day. I only explore my limits once or twice a week. I typically do 2 hard days, 2 easy days of low rep basic pull ups, and 1 or 2 days doing other exercises like handstand pushups or bridges. The focus of every workout–even the easy days–is perfect technique. The most technically demanding aspect of the training is undoubtedly the kip. If you call kipping pull ups cheater pull ups, you’ve probably never tried them. Even many erstwhile strong folks lack the full body coordination to pull one off correctly, let alone string them together. You really need to see this rather than read it described in words, so here is a two-part video tutorial by the excellent Laurie Galassi. In the beginning, invest lots of time doing the swing, hop, pull drill described in part 2. However, since I advise using a thumbs-around grip instead of thumbs on top grip, I do this drill with one slight modification to the “hop” part. Instead of hopping on the bar I get enough air to loosen my grip a little, rotate my hand forward around the bar and “regrip” it. Regrip practice is very helpful for later on when your hands inevitably start to slip off the bar during a kipping set. Jessica Estrada of CrossFit Jääkarhu (I’ll save you the Google search, it means polar bear in Finnish) also has a number of excellent training videos on kipping pull ups and how to string them together. And of course eventually you need to develop enough power in your kip to get yourself up over the bar into position to press out at the top. I have not mastered all of my milestone targets to my satisfaction yet. But I can already see how pseudo-false grip pull ups and Russian dips on the parallel bars will eventually bridge to a full muscle up. I feel that I am further away from the straight bar muscle up. I still find the kipping motion quite frustrating, though I am making progress. Per the recommendation of some trainers, I’ve been considering using a stretch band for assistance on the bar so I can focus on really dialing in the movement pattern. But then again I might not because I really hate to involve equipment beyond what I can find at my local park. I hope this post serves as a good starting point in your muscle up journey. In my mind once all four milestone exercises have been mastered, you’ve basically got the muscle up. But of course it probably won’t prove so easy. If I find more insights along the way I will post them, but for now it’s time to hit the bars!